The department of uro/nephro-anesthesia has skilled anaesthesiologists who have been working in this field for over 20 years. They are specialized in managing newborn children, adults, and patients with renal failure, who require interventions and surgery. 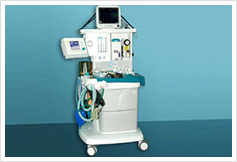 The department is also well-equipped with the required monitoring equipment to support tertiary care urology. The word ‘anaesthesia’ means ‘without feeling pain’. It refers to a variety of methods used to make an operation painless for the patient. A specialist doctor called an anaesthesiologist administers anaesthesia. He or she also monitors the patient’s vital signs such as heart rate, blood pressure, breathing and oxygenation during the operation, and treats any acute medical conditions that may arise. An anaesthesiologist is not just a doctor behind a mask who keeps you pain-free and comfortable during your surgery. A modern-day anaesthesiologist has a wider role to play. He or she performs the pre-operative assessment of the patient and the intra-operative management (intra-operative management refers to keeping the patient pain-free and comfortable as well as treating any medical problems that may arise during surgery). The anaesthesiologist also performs the post-operative pain management. Depending upon the type of surgery and the patient’s medical condition, the anaesthesiologist will decide upon the anaesthetic technique (such as for paediatric patients, patients with renal failure, for renal transplant surgery, laparoscopic surgery, and for geriatric patients). Pain management in the post-operative period is one of the vital functions performed by the anaesthetist to keep the patient pain-free and as comfortable as possible during recovery. Continuous Caudal Epidural Anaesthesia: In continuous caudal epidural anaesthesia, a catheter is placed in the caudal epidural space and local anaesthetic drugs are injected through it. This is particularly used in paediatric patients. Epidural Anaesthesia: In epidural anaesthesia, local anaesthetic and narcotic analgesics are injected via a catheter placed near the spinal cord. This is used in patients who undergo major surgeries, laparoscopic surgeries, etc. Patient-Controlled Analgesia: In patient-controlled analgesia, analgesic drugs are filled in a dispenser that is connected to an IV canula. The patient can press the button on the dispenser when he feels pain. ‘Sedation’ means ‘to relieve anxiety’ and ‘analgesia’ means ‘to provide pain relief’. ECG Monitor: to monitor heart rate and its electrical activity. Blood Cuff: A blood cuff around the patient’s upper arm to check his or her blood pressure. Pulse Oximeter: to measure the amount of oxygen in the blood.